Ductless cooling and heating systems offer energy-efficient and responsive climate control in a compact, unobtrusive package. Read on to learn more about the benefits of this increasingly popular technology. The average homeowner typically doesn’t get to select his own HVAC system. Instead, he or she usually inherits the components decided upon by a previous owner or the original builder. That said, many common scenarios give you the freedom to choose your own climate-control technology. Making your choice, however, can be difficult. After all—compared with, say, picking a paint color—picking an HVAC system raises some intimidatingly complex questions. On the one hand, given rising energy costs, it’s hard to overstate the importance of efficiency. On the other hand, because climate control so greatly influences home comfort, there are key considerations beyond operating cost alone. 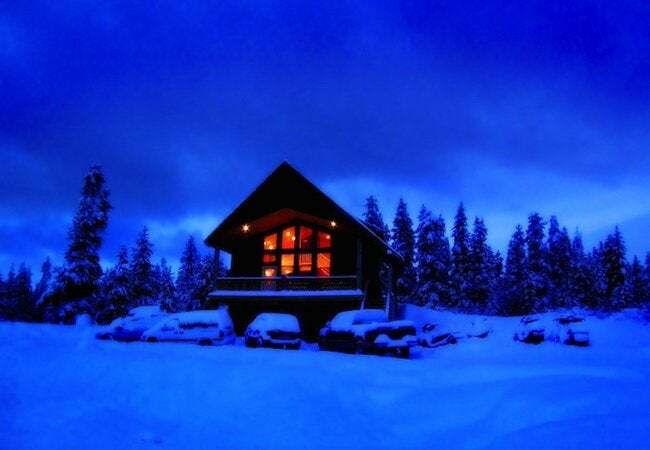 Complicating matters even further is that, in many parts of the country, extreme conditions call for both wintertime heating and summertime cooling. In short, there’s a lot to think about. In search of a simple, highly effective solution, increasing numbers of homeowners are choosing to forgo traditional options in favor of the extreme energy-saving, comfort-creating, compact ductless systems from Mitsubishi Electric. Americans are accustomed to large-scale HVAC systems that are made even more unwieldy by elaborate networks of ducts. 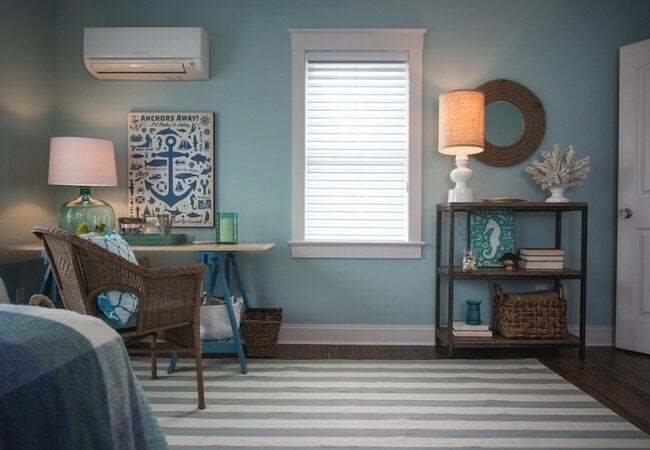 True to their name, ductless systems from Mitsubishi Electric do not require ductwork (though they can be integrated with existing ducts, if desired). The company’s ductless systems are considerably more compact than conventional forced-air configurations. In fact, the most basic Mitsubishi Electric system includes only three components—an outdoor condenser, an indoor unit and a handheld remote controller. 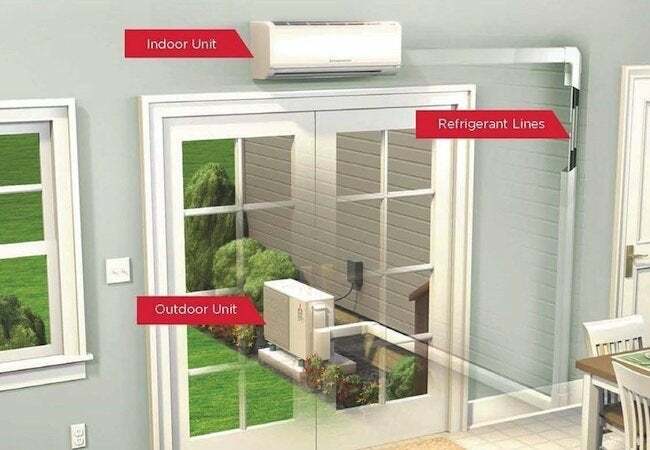 The outdoor and indoor units are connected by a pair of refrigerant pipes small enough to fit through a three-inch hole in the exterior wall. 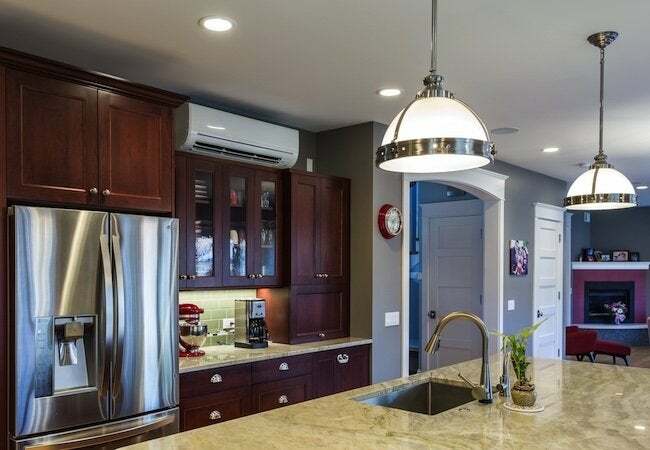 A large home with ductless cooling and heating would require multiple indoor units, and maybe even multiple condensers, but no matter the square footage of the conditioned space, Mitsubishi Electric never veers from its fundamentally streamlined design. Precisely because they’re so nonintrusive, Mitsubishi Electric ductless systems lend themselves to straightforward, labor-saving installation. A conventional ducted HVAC system might take weeks to set up, but a Mitsubishi Electric system can often be installed in one day. Enter any residence built in the years following World War II, and regardless of the neighborhood, house size, or architectural style, you’re likely to see ductwork. Though ubiquitous, ducts are infamous for their poor energy efficiency. Particularly when traveling through uninsulated space, ducts lose enough energy to compromise the overall system efficiency by around 25 percent. The furnace or air conditioner must then work overtime to maintain a comfortable indoor temperature, and at the end of the month the homeowner has to pay more to the energy company, all because forced-air HVAC is hampered by a serious design flaw. 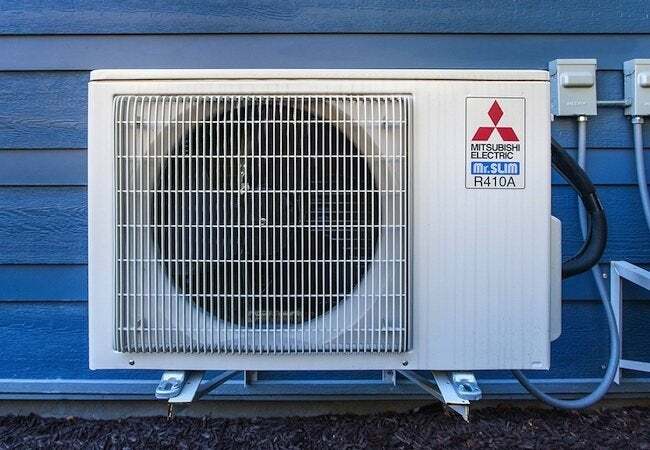 Consider that Mitsubishi Electric ductless systems come with none of the air-leak, dirty-duct problems that cause older cooling and heating options to run up such high costs. In fact, many products belonging to the Mitsubishi Electric line are rated by ENERGY STAR®, indicating that they operate on dramatically less energy than their peers. In fact, if you opt for a ductless system from Mitsubishi Electric, you can expect bills that are 30-40 percent lower than what you may be accustomed to paying. Even though Mitsubishi Electric ductless systems lead to lower utility bills, they don’t skimp on performance. On the contrary, the inexpensive-to-run technology still manages to deliver cooling and heating of a caliber well above that of forced-air systems. In part, that’s because conventional HVAC usually cycles on and off, creating uncomfortable temperature swings. Mitsubishi Electric ductless systems, on the other hand, maintain even temperatures by constantly monitoring the ambient temperature and adjusting their output accordingly. Mitsubishi Electric departs from tradition in yet another way. 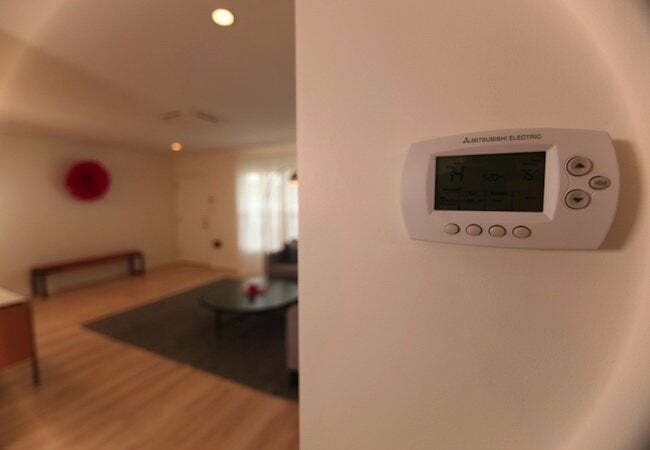 In a typical forced-air installation, one thermostat controls the temperature for the entire house. That means if you want the upstairs bedroom to be a bit cozier, you must also heat the kitchen, even if your spouse has already complained that it feels too warm. Mitsubishi Electric enables you to establish different zones, each with its own indoor unit and thermostat. That way, different family members with different climate-control preferences can all be comfortable at the same time—finally. Even in extreme winter temperatures, you can depend on the most advanced Mitsubishi Electric ductless systems for unflagging comfort. At temperatures as low as -13 degrees Fahrenheit, systems equipped with Hyper-Heating INVERTER capability ensure that homeowners retain the efficiency and comfort benefits without resorting to supplemental heat that set Mitsubishi Electric apart. Heating mode also incorporates a set of special additional features. For instance, thanks to patented technology, INVERTER systems reach their target temperature in much less time than it would take a traditional furnace to warm up. If you’re used to wearing your scarf and gloves indoors, just wait: With Mitsubishi Electric, total comfort is mere moments away. And it couldn’t be easier to toggle between cooling and heating modes—it takes only the push of a button. When cooling, the ductless system collects heat from the home and sends it outside. In winter, operation reverses. That’s right, Mitsubishi Electric harvests heat in below-zero weather and uses it to keep your home toasty warm through the coldest days of the year! In the end, many homeowners view HVAC as a source not only of cooling and heating, but also of confusion and mystery. There’s little mystery, however, about the appeal of Mitsubishi Electric ductless systems. With one simple solution, you can achieve total comfort and save money, all year-round.